Pyrrhus (318 BC - 272 BC) (Πύρρος της Ηπείρου, "the color of fire, reddish, red-blonde") was the king of Epirus from 306 - 301 BC and again from 297 - 272 BC. Prince of one of the Alexandrian successor states, Pyrrhus was dethroned at the age of 17 when he left his kingdom to attend a wedding. In wars of the diadochi Pyrrhus fought beside his brother-in-law Demetrius I of Macedon in battle of Ipsus (301 BC). Later, he become hostage of Ptolemy I of Egypt in treaty between Ptolemy I and Demetrius. Pyrrhus married Ptolemy's I stepdaughter Antigone and in 297 BC restored his kingdom of Epirus. Next, he went to war against his former ally, Demetrius. By 286 BC he had deposed his former brother-in-law and took control over the Kingdom of Macedonia. Pyrrhus was driven out of Macedonia by Lysimachus, his former ally, in 284 BC. In 281 the Greek city of Tarentum, in southern Italy, fell out with Rome, and was faced with a Roman attack and certain defeat. Rome had already made itself into a major power, and poised to subdue all the Greek cities in Magna Graeca or Southern Italy. The Tarentines begged Pyrrhus to intervene and save them from Roman conquest. Pyrrhus was encouraged to aid the Tarentines by an oracle from Delphi. His goals were not, however, selfless. He recognized the possibility of carving out an empire for himself in Italy. He made an alliance with Ptolemy Ceraunus, King of Macedon and his most powerful neighbor, and arrived in Italy in 280 BC. He entered in Italy with forces of 3,000 cavalry, 2,000 archers, 500 slingers, 20,000 infantry and 19 war elephants in a bid to subdue the Romans. Due to his superior cavalry and his elephants he defeated the Romans in battle of Heraclea under their consul Publius Valerius Laevinus in 280 BC. Romans lost about 7,000 and Pyrrhus 4,000 soldiers. Several tribes (the Lucanians, Bruttians, and Messapians) and the Greek cities of Croton and Locri joined Pyrrhus. He then offered Romans a peace treaty, which was rejected. Pyrrhus spent winter in Campania. When Pyrrhus invaded Apulia (279 BC), the two armies met in the Battle of Asculum (279) where Pyrrhus won a very costly victory. The Romans had lost 6,000 men and Pyrrhus 3,500. In 278, Pyrrhus received two offers simultaneously. The Greek cities in Sicily asked him to come and drive out Carthage (with Rome, one of the two great powers in the Western Mediterranean). At the same time, the Macedonians, whose King Ceraunus had been killed by invading Gauls, asked Pyrrhus to ascend the throne of Macedon. Pyrrhus decided that Sicily offered him a greater opportunity, and transferred his army there. Pyrrhus was proclaimed king of Sicily. He was already making plans for his son Helenus to inherit the kingdom of Sicily, and his other son Alexander to be given that of Italy. In 277 Pyrrhus captured Eryx, the strongest Carthaginian fortress in Sicily. This prompted the rest of the Carthaginian-controlled cities to defect to Pyrrhus. In 276, Pyrrhus negotiated with the Carthaginians. Although they were inclined to come to terms with Pyrrhus, supply him money and send him ships once friendly relations were established, he demanded that Carthage abandon all Sicily and make the Libyan Sea a boundary between themselves and the Greeks. Meanwhile, he had begun to display despotic behavior towards the Sicilian Greeks, and soon Sicilian opinion became inflamed against him. Though he defeated the Carthaginians in another battle, he was forced to abandon Sicily and return to Italy. Eventually, he was defeated at Beneventum (275 BC) in Sicily, being trumped by the discipline and new tactics of the Roman Republican Legions. Pyrrhus abandoned the campaign in Italy and returned to Epirus. Attacking King Antigonus II Gonatas he won an easy victory and seized the Macedonian throne. 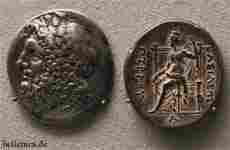 In 272, Cleonymus, a Spartan of royal blood but hated in Sparta, asked Pyrrhus to attack Sparta and place him in power. Pyrrhus agreed to the plan, intending to win control of the Peloponnese for himself, but unexpectedly strong resistance thwarted his assault on Sparta. He was immediately offered an opportunity to intervene in a civic dispute in Argos. Entering the city with his army by stealth, he found himself caught in a confused battle in the narrow city streets. During the confusion, an old woman watching from a rooftop threw a roofing tile and killed him. While he was a mercurial and often restless leader, and not always a wise king, he was considered one of the greatest military commanders of his times, ranked by Hannibal himself to be the second greatest commander the world had seen after Alexander the Great. As a general, Pyrrhus' greatest political weaknesses were the failure to maintain focus and the failure to maintain a strong treasury at home (many of his soldiers were costly mercenaries). His name is famous for the phrase "Pyrrhic victory" which refers to an exchange after the Battle of Asculum. In response to congratulations for winning a costly victory over the Romans, he is reported to have said: "One more such victory and I shall be lost!" Pyrrhus wrote Memoirs and several books on art of war. 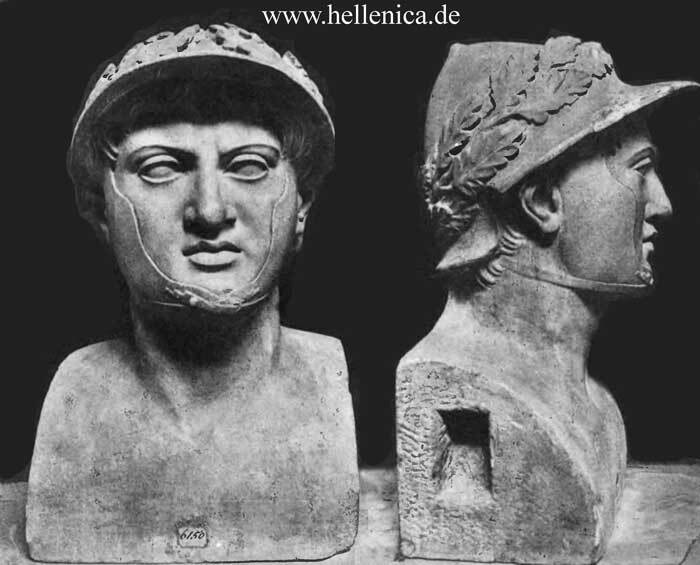 The Athenians have also a statue of Pyrrhus. This Pyrrhus was not related to Alexander, except by ancestry. Pyrrhus was son of Aeacides, son of Arybbas, but Alexander was son of Olympias, daughter of Neoptolemus, and the father of Neoptolemus and Aryblas was Alcetas, son of Tharypus. And from Tharypus to Pyrrhus, son of Achilles, are fifteen generations. Now Pyrrhus was the first who after the capture of Troy disdained to return to Thessaly, but sailing to Epeirus dwelt there because of the oracles of Helenus. By Hermione Pyrrhus had no child, but by Andromache he had Molossus, Pielus, and Pergamus, who was the youngest. Helenus also had a son, Cestrinus, being married to Andromache after the murder of Pyrrhus at Delphi. Helenus on his death passed on the kingdom to Molossus, son of Pyrrhus, so that Cestrinus with volunteers from the Epeirots took possession of the region beyond the river Thyamis, while Pergamus crossed into Asia and killed Areius, despot in Teuthrania, who fought with him in single combat for his kingdom, and gave his name to the city which is still called after him. To Andromache, who accompanied him, there is still a shrine in the city. Pielus remained behind in Epeirus, and to him as ancestor Pyrrhus, the son of Aeacides, and his fathers traced their descent, and not to Molossus. Down to Alcetas, son of Tharypus, Epeirus too was under one king. But the sons of Alcetas after a quarrel agreed to rule with equal authority, remaining faithful to their compact; and afterwards, when Alexander, son of Neoptolemus, died among the Leucani, and Olympias returned to Epeirus through fear of Antipater, Aeacides, son of Arybbas, continued in allegiance to Olympias and joined in her campaign against Aridaeus and the Macedonians, although the Epeirots refused to accompany him. Olympias on her victory behaved wickedly in the matter of the death of Aridaeus, and much more wickedly to certain Macedonians, and for this reason was considered to have deserved her subsequent treatment at the hands of Cassander; so Aeacides at first was not received even by the Epeirots because of their hatred of Olympias, and when after wards they forgave him, his return to Epeirus was next opposed by Cassander. When a battle occurred at Oeneadae between Philip, brother of Cassander, and Aeacides, Aeacides was wounded and shortly after met his fate. The Epeirots accepted Alcetas as their king, being the son of Arybbas and the elder brother of Aeacides, but of an uncontrollable temper and on this account banished by his father. Immediately on his arrival he began to vent his fury on the Epeirots, until they rose up and put him and his children to death at night. After killing him they brought back Pyrrhus, son of Aeacides. No sooner had he arrived than Cassander made war upon him, while he was young in years and before he had consolidated his empire. When the Macedonians attacked him, Pyrrhus went to Ptolemy, son of Lagus, in Egypt. Ptolemy gave him to wife the half-sister of his children, and restored him by an Egyptian force. The first Greeks that Pyrrhus attacked on becoming king were the Corcyraeans. He saw that the island lay off his own territory, and he did not wish others to have a base from which to attack him. My account of Lysimachus has already related how he fared, after taking Corcyra, in his war with Lysimachus, how he expelled Demetrius and ruled Macedonia until he was in turn expelled by Lysimachus, the most important of his achievements until he waged war against the Romans, being the first Greek we know of to do so. For no further battle, it is said, took place between Aeneas and Diomedes with his Argives. One of the many ambitions of the Athenians was to reduce all Italy, but the disaster at Syracuse prevented their trying conclusions with the Romans. Alexander, son of Neoptolemus, of the same family as Pyrrhus but older, died among the Leucani before he could meet the Romans in battle. So Pyrrhus was the first to cross the Ionian Sea from Greece to attack the Romans. And even he crossed on the invitation of the Tarentines. For they were already involved in a war with the Romans, but were no match for them unaided. Pyrrhus was already in their debt, because they had sent a fleet to help him in his war with Corcyra, but the most cogent arguments of the Tarentine envoys were their accounts of Italy, how its prosperity was equal to that of the whole of Greece, and their plea that it was wicked to dismiss them when they had come as friends and suppliants in their hour of need. When the envoys urged these considerations, Pyrrhus remembered the capture of Troy, which he took to be an omen of his success in the war, as he was a descendant of Achilles making war upon a colony of Trojans. Pleased with this proposal, and being a man who never lost time when once he had made up his mind, he immediately proceeded to man war ships and to prepare transports to carry horses and men-at-arms. There are books written by men of no renown as historians, entitled "Memoirs." When I read these I marvelled greatly both at the personal bravery of Pyrrhus in battle, and also at the forethought he displayed whenever a contest was imminent. So on this occasion also when crossing to Italy with a fleet he eluded the observation of the Romans, and for some time after his arrival they were unaware of his presence; it was only when the Romans made an attack upon the Tarentines that he appeared on the scene with his army, and his unexpected assault naturally threw his enemies into confusion. And being perfectly aware that he was no match for the Romans, he prepared to let loose against them his elephants. 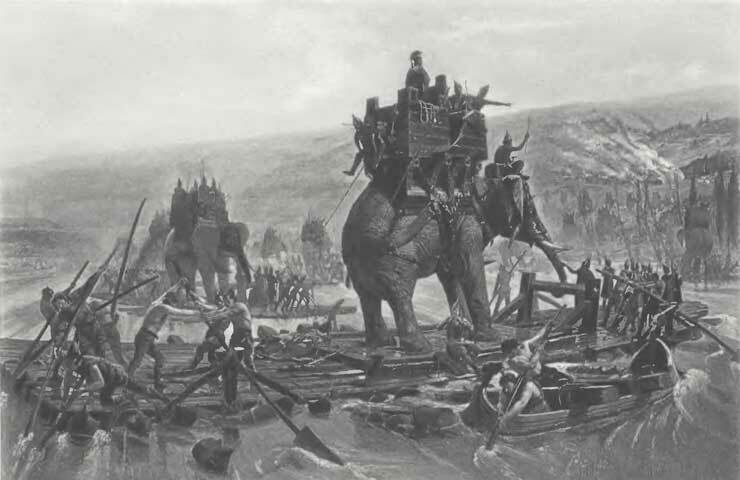 The first European to acquire elephants was Alexander, after subduing Porus and the power of the Indians; after his death others of the kings got them but Antigonus more than any; Pyrrhus captured his beasts in the battle with Demetrius. When on this occasion they came in sight the Romans were seized with panic, and did not believe they were animals. For although the use of ivory in arts and crafts all men obviously have known from of old, the actual beasts, before the Macedonians crossed into Asia, nobody had seen at all except the Indians themselves, the Libyans, and their neighbours. This is proved by Homer, who describes the couches and houses of the more prosperous kings as ornamented with ivory, but never mentions the beast; but if he had seen or heard about it he would, in my opinion have been much more likely to speak of it than of the battle between the Dwarf-men and cranes. Pyrrhus was brought over to Sicily by an embassy of the Syracusans. The Carthaginians had crossed over and were destroying the Greek cities, and had sat down to invest Syracuse, the only one now remaining. When Pyrrhus heard this from the envoys he abandoned Tarentum and the Italiots on the coast, and crossing into Sicily forced the Carthaginians to raise the siege of Syracuse. In his self-conceit, although the Carthaginians, being Phoenicians of Tyre by ancient descent, were more experienced sea men than any other non-Greek people of that day, Pyrrhus was nevertheless encouraged to meet them in a naval battle, employing the Epeirots, the majority of whom, even after the capture of Troy, knew no thing of the sea nor even as yet how to use salt. Witness the words of Homer in the Odyssey: -- Nothing they know of ocean, and mix not salt with their victuals. 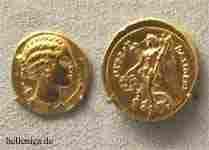 Worsted on this occasion Pyrrhus put back with the remainder of his vessels to Tarentum. Here he met with a serious reverse, and his retirement, for he knew that the Romans would not let him depart without striking a blow, he contrived in the following manner. On his return from Sicily and his defeat, he first sent various dispatches to Asia and to Antigonus, asking some of the kings for troops, some for money, and Antigonus for both. When the envoys returned and their dispatches were delivered, he summoned those in authority, whether Epeirot or Tarentine, and without reading any of the dispatches declared that reinforcements would come. A report spread quickly even to the Romans that Macedonians and Asiatic tribes also were crossing to the aid of Pyrrhus. The Romans, on hearing this, made no move, but Pyrrhus on the approach of that very night crossed to the headlands of the mountains called Ceraunian. After the defeat in Italy Pyrrhus gave his forces a rest and then declared war on Antigonus, his chief ground of complaint being the failure to send reinforcements to Italy. Overpowering the native troops of Antigonus an his Gallic mercenaries he pursued them to the coast cities, and himself reduced upper Macedonia and the Thessalians. The extent of the fighting and the decisive character of the victory of Pyrrhus are shown best by the Celtic armour dedicated in the sanctuary of Itonian Athena between Pherae and Larisa, with this inscription on them: -- Pyrrhus the Molossian hung these shields taken from the bold Gauls as a gift to Itonian Athena, when he had destroyed all the host of Antigonus. 'Tis no great marvel. The Aeacidae are warriors now, even as they were of old. -- These once ravaged golden Asia, and brought slavery upon the Greeks. Now ownerless they lie by the pillars of the temple of Zeus, spoils of boastful Macedonia. Pyrrhus came very near to reducing Macedonia entirely, but, being usually readier to do what came first to hand, he was prevented by Cleonymus. This Cleonymus, who persuaded Pyrrhus to abandon his Macedonian adventure and to go to the Peloponnesus, was a Lacedaemonian who led an hostile army into the Lacedaemonian territory for a reason which I will relate after giving the descent of Cleonymus. Pausanias, who was in command of the Greeks at Plataea, was the father of Pleistoanax, he of Pausanias, and he of Cleombrotus, who was killed at Leuctra fighting against Epaminondas and the Thebans. 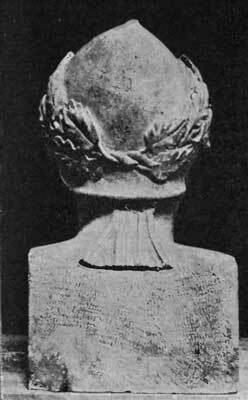 Cleombrotus was the father of Agesipolis and Cleomenes, and, Agesipolis dying without issue, Cleomenes ascended the throne. Cleomenes had two sons, the elder being Acrotatus and the younger Cleonymus. Now Acrotatus died first; and when afterwards Cleomenes died, a claim to the throne was put forward by Areus son of Acrotatus, and Cleonymus took steps to induce Pyrrhus to enter the country. Before the battle of Leuctra the Lacedaemonians had suffered no disaster, so that they even refused to admit that they had yet been worsted in a land battle. For Leonidas, they said, had won the victory, but his followers were insufficient for the entire destruction of the Persians; the achievement of Demosthenes and the Athenians on the island of Sphacteria was no victory, but only a trick in war. Their first reverse took place in Boeotia, and they afterwards suffered a severe defeat at the hands of Antipater and the Macedonians. Thirdly the war with Demetrius came as an unexpected misfortune to their land. Invaded by Pyrrhus and seeing a hostile army for the fourth time, they arrayed themselves to meet it along with the Argives and Messenians who had come as their allies. Pyrrhus won the day, and came near to capturing Sparta without further fighting, but desisted for a while after ravaging the land and carrying off plunder. The citizens prepared for a siege, and Sparta even before this in the war with Demetrius had been fortified with deep trenches and strong stakes, and at the most vulnerable points with buildings as well. Just about this time, while the Laconian war was dragging on, Antigonus, having recovered the Macedonian cities, hastened to the Peloponnesus being well aware that if Pyrrhus were to reduce Lacedaemon and the greater part of the Peloponnesus, he would not return to Epeirus but to Macedonia to make war there again. When Antigonus was about to lead his army from Argos into Laconia, Pyrrhus himself reached Argos. Victorious once more he dashed into the city along with the fugitives, and his formation not unnaturally was broken up. 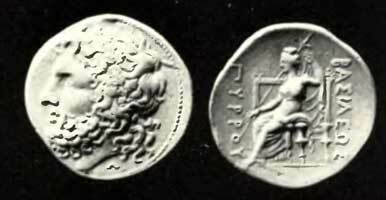 A coin from Epirus. 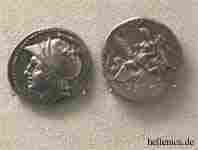 On left is the head of Pyrrhus' mother, Phthia. On the right is Athena, shield and spear in hands with a battle stance. The Greek inscription reads ΒΑΣΙΛΕΩΣ ΠΥΡΡΟΥ ([coin] of King Pyrrhus). When the fighting was now taking place by sanctuaries and houses, and in the narrow lanes, between detached bodies in different parts of the town, Pyrrhus left by himself was wounded in the head. It is said that his death was caused by a blow from a tile thrown by a woman. The Argives however declare that it was not a woman who killed him but Demeter in the likeness of a woman. This is what the Argives themselves relate about his end, and Lyceas, the guide for the neighborhood, has written a poem which confirms the story. They have a sanctuary of Demeter, built at the command of the oracle, on the spot where Pyrrhus died, and in it Pyrrhus is buried. I consider it remarkable that of those styled Aeacidae three met their end by similar heaven-sent means; if, as Homer says, Achilles was killed by Alexander, son of Priam, and by Apollo, if the Delphians were bidden by the Pythia to slay Pyrrhus, son of Achilles, and if the end of the son of Aeacides was such as the Argives say and Lyceas has described in his poem. The account, how ever, given by Hieronymus the Cardian is different, for a man who associates with royalty cannot help being a partial historian. If Philistus was justified in sup pressing the most wicked deeds of Dionysius, because he expected his return to Syracuse, surely Hieronymus may be fully forgiven for writing to please Antigonus. So ended the period of Epeirot ascendancy. "The Pyrrhus Portrait" by Rolf Winkes, in: The Age of Pyrrhus, Proceedings of an International Conference held at Brown University April 8-10, 1988 (Archaeologia Transatlantica XI) Providence 1992, pages 175-188.